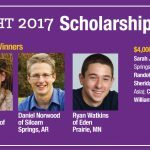 I read this article and wanted to share it with you: 2017 Sonlight Scholarship Winners! 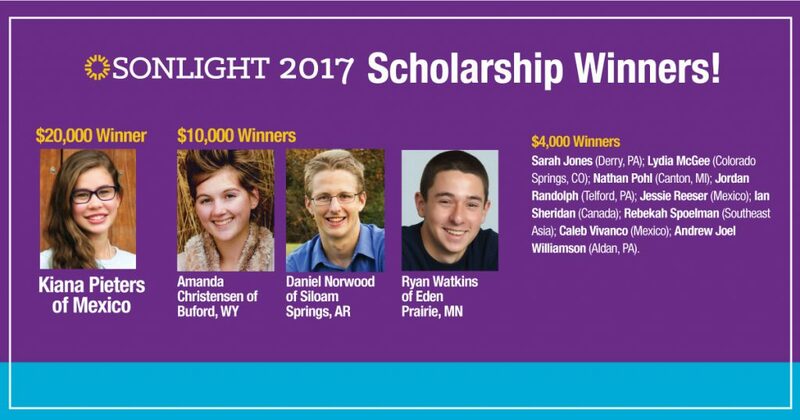 https://blog.sonlight.com/2017-sonlight-scholarship-winners.html. History / Bible / Literature programs, including at least one high school program. Their exceptional talent, along with an eagerness to follow God’s leading, make it a joy for us to invest in their continuing education. 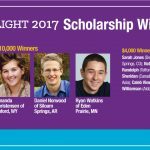 Sonlight has awarded well over $1,000,000 since we began the scholarship program, including $86,000 over the next four years to these 13 winners. 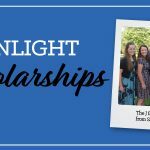 We look forward to seeing all God does in and through them as they take what they’ve learned – through Sonlight and their homeschool experience – into college and the world beyond. Amanda Christensen of Buford, WY is a problem-solver whose greatest passions are medicine and cattle. She plans to major in Chemical Engineering at the University of Wyoming and then start veterinarian school. A leader in her 4H club, Amanda also holds significant responsibility at her family’s cattle ranch. Among other work, she tracks each cattle’s medical care and watches over those in the maternity pen. Her sharp mind and quick interventions in emergency situations have proven her aptitude for veterinarian work. She also serves the children who ride the Sunday School bus to her church. She helps with and plays the piano for children’s church and visits the children in their homes each week. Amanda says the literature she has read with Sonlight has helped her develop sympathy for people in situations she might not otherwise understand. Her hope is to share the Gospel through her life as she serves animals and the people who rely on them. Daniel Norwood of Siloam Springs, AR is the very picture of integrity and diligence. He has used Sonlight every year since preschool. A natural problem solver and leader, his stated purpose in life is simply to serve God. And he does that in many capacities. The second of eight children, Daniel is a mentor and role model to his younger siblings. Happy to work behind the scenes, he is eager to see a need and fill it, whether at home, at work or in his service positions. He is an integral employee at the Christian camp where he works in the kitchen and as a counselor. After earning his Eagle Scout rank in 2014, Daniel has continued participating and serving in his Boy Scouts troop, training and teaching the younger men. With a strong academic background, he is headed to John Brown University in Arkansas in order to major in electrical or mechanical engineering. Ryan Watkins of Eden Prairie, MN has used Sonlight since preschool. With a near-perfect 1570 on the SAT and 35 on the ACT, Ryan has a brilliant mind for engineering as well as an accomplished artistic sensibility. He recently developed a successful laser engraving system for a manufacturing company where he interned for a year. A National Merit Finalist, his central passion is to follow wherever God leads him, and he is particularly energized by problems in physics that we do not yet understand. Ryan is a voracious reader with a hunger for knowledge. The oldest of 9 children, Ryan is a leader at home, quick to serve and encourage his siblings. He also regularly spends time with elderly community members at the local café. He has applied to several top engineering schools, with plans to major in both Electrical and Mechanical Engineering. An avid outdoorsman, Ryan thrives on “high octane” adventures such as downhill skiing, whitewater rafting, mountain biking and scuba diving. Lydia McGee of Colorado Springs, CO plans to major in global or public health before heading to graduate school for physical therapy. Through a struggle with a rare and painful nerve disorder, Lydia encountered how much relief and hope physical therapists can bring to suffering people. She hopes to minister to others in the same way her physical therapist helped her. She dreams of serving as a medical worker overseas. A National Merit Commended Scholar, Lydia is well-prepared for the academic path ahead. She is a successful swimmer and plays guitar with her youth group worship team. She loves to write mysteries and has won two regional awards for her work. Those who know her attest to the positive attitude that infuses everything Lydia does. Nathan Pohl of Canton, MI dreams of working behind the scenes to help professional sports teams make a positive impact on their community. With a 34 on the ACT, Nathan hopes to attend either Calvin College or Hope College to major in Business Management. An outstanding ice hockey player and distance runner, Nathan has an offer to play hockey at one of his top-pick schools. Through tremendous leadership and diligence, he has raised $21,000 to fund research for Type 1 (Juvenile) Diabetes. He participates in mission trips each summer, volunteers for his church’s VBS, has served as worship leader several times in his church, and even preached a sermon. He regularly serves the homeless population of Detroit. A deep thinker who also works as a tutor for younger students, Nathan’s goal in life is to be an ambassador for Christ in the world. Jessie Susannah Reeser of Mexico has used Sonlight since second grade. Unafraid of the challenges ahead, she plans to become a medical doctor. Susannah lives close to two of the best U.S. accredited medical schools in Mexico, and plans to enroll at one of them next year so she can start her medical training right away. An outstanding gymnast, Susannah has competed and flourished in national and international competitions. She has delighted in coaching younger gymnasts for the past four years. She also is the leader and coordinator of a local dance workshop through Youth With A Mission. Susannah serves as an administrator in her local YWAM chapter, regularly leads large groups of children there, and has participated in several YWAM mission trips. She hopes to use everything she has learned through homeschooling, gymnastics and YWAM to serve the physical and spiritual needs of those around her. Ian Sheridan of Canada plans to attend Trinity Western University in preparation for a career in neuroscience. Clearly gifted in math and science, Ian’s dream is to work as a researcher to better understand depression and other mental disorders so that he can find a cure or more effective treatments for them. His openness and honesty is refreshing to those around him – from the fellow teens he leads in a Bible study, to the children he serves at the kids club he started with friends in a low-income housing development. He serves on the sound team at church and often works as the lead sound engineer for funerals and weddings. He operates his own lawn and yard work business and also helps teach a weekly homeschool PE class. Ian is a serious pianist who also enjoys playing guitar, ukulele and violin. Rebekah Spoelman of Southeast Asia portrays an unusual maturity in her love, understanding and care for the disadvantaged people around her. Many of her close friends are illiterate, and Rebekah is keenly aware of the persistent struggles they will face in life. Her dream is to earn a college degree in the US and then return to her country to open several businesses that will provide a living wage, job training and education for her employees, equipping them to thrive in their culture. Rebekah provides in-home wound care for a neighbor suffering from diabetes, and routinely prepares meals for large groups of children who come to her home for tutoring. She is one of the local children’s favorite AWANA leaders. Rebekah is eager to serve, extremely hard-working and competent in the very practical challenges of living cross-culturally in a difficult area. Caleb Vivanco of Mexico has used every Sonlight program from Level A through 400. A born musician, Caleb used to sleep with his drumsticks in his toddler bed so that he could start creating rhythms as soon as he woke. A key member of his church’s worship band, Caleb often records and creates multi-instrument sound tracks so that he can play along and provide live music for outreach events even when there aren’t enough other musicians. Caleb’s other big love is science, which he hopes to use to “glorify God and point people to the Creator.” Caleb plans to major in Chemistry at a top academic Christian university. Caleb is known for his quiet integrity, his sensitive heart toward others, and his ability to bring out the best in those around him. Andrew Joel Williamson of Aldan, PA is a self-motivated learner ready to tackle anything. He is headed to Taylor University to study Biology and prepare for a career as a scientist. Intensely interested in plants and animals, Andrew is working with his father to research, develop and implement a sustainable small farming method that will allow rural unpaid pastors in Honduras to feed their families and earn an income. In his own words, Andrew says “I want to be an example of Christ to the secular world through science. I plan to dedicate my life to representing God through excellence in biology.” Andrew has worked with his autism diagnosis to overcome great obstacles. He frequently serves as a Spanish/English interpreter, and worked with a native to be conversational in a new regional language last year in order to minister more effectively alongside his family. 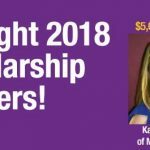 Click here to learn more about Sonlight's college scholarships.